The game was more than close, but in the end the story was the same. 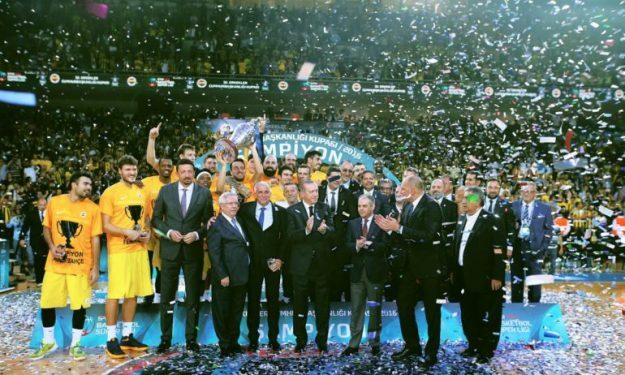 Fenerbahce prevailed over Anadolu Efes in th final of the President’s Cup in Turkey. Like it happened in the last BSL finals, the players of Obradovic found the way to win, this time with a 77-69 score. Anadolu Efes was trailing 37-29 at half time, didn’t let Fenerbahce build a much bigger advantage, but also never got really near. Gigi Datome with 19 points and Bobby Dixon with 19 were the top scorer of the winners, while Jan Vesely (15 p.), Ekpeh Udoh (11 p.) and Kostas Sloukas (12 p.) also did their job. Dixon got also the MVP award of the game. For Anadolu Efes Jason Granger had 15 points, Tyler Honeycutt added 13, while Thomas Heurtel scored 12.